Whether you are sitting at home on your couch or out enjoying the view from your campsite, you need to eat. 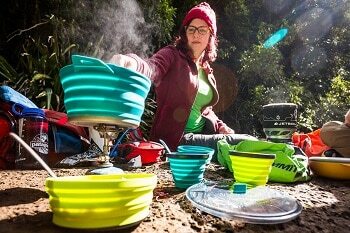 As a backpacker/camper, you need to have the best camping cookware you can find to make your life not only easier but also practical to cook some decent eats. The first thing that comes to mind is a large cast iron skillet that cooks your bacon in the morning and your cornbread at night. Obviously, a backpacker is not going to carry this skillet or the foods that go into it. Car campers may have the luxury, but if weight and volume are a concern you will need to look at some other styles of cookware. 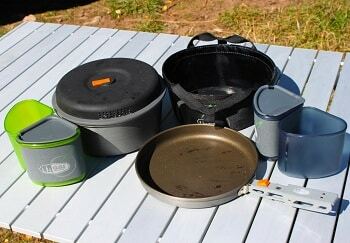 We are going to review the 10 best camping cookware sets. Maybe you will find one that fits your needs. 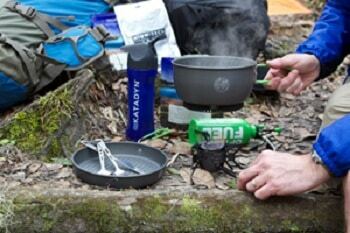 To see more of the best backpacking stoves, see our article on this topic for more information. Before you decide on cookware, you need to determine how you are going to use it. There are basically two options: 1) Campfire and 2) Camp Stove. Both options are fine choices; it is possible you would use both. Here are a few things to consider. Campfires are fun and give added light and heat during the nighttime hours. Camp stoves can heat water very quickly. Campfires are not easy on your expensive gear; Ripstop nylon and other lightweight materials burn quickly. Camp stoves come in a variety of shapes, sizes, and fuel types. The flames will burn up the sides of your pot, making it extremely hot. Any plastic handle, lid or detail will melt. The flames on a camp stove are more controlled and focus on the bottom of the pot. In heavy rain, it is difficult to start a fire and you would have no way to make anything warm to eat or drink. No matter what the weather, you will be able to fix a hot drink and something warm to eat. There may be places campfires are prohibited and then you are out of luck for any source of heat or cooking. Camp stoves can most always be used no matter where you are. You may need to stop for the night and find no viable wood to burn. 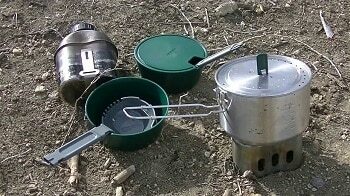 Camp stoves are always reliable and can be used when no wood is available. Campfires leave a scar on the land. The “leave no trace” motto is really impossible; there will be some sort of a scar. Camp stoves will leave no trace. It is suggested to have two pots for two people in your party. 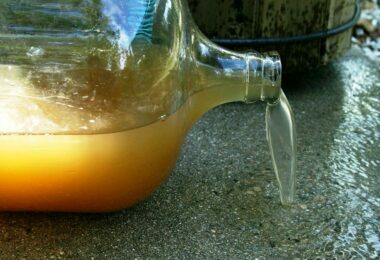 A 1.5-liter and 2-liter pot will work fine. Make sure you have a lid for each pot. It will speed up cooking time. Also, if you are using a camp stove it will save on fuel. A cook set will accommodate larger groups; there are more pots and bigger pots for fixing larger quantities. 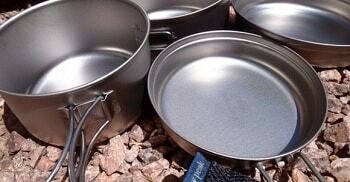 Nesting pots and pans are best for saving space in your pack. There are several types of materials from which to choose. The main ones are aluminum alloy, steel, and titanium. Things to consider are weight, durability, and performance. Titanium is the preferred materials. For that preference, you get a very lightweight product that is extremely durable. It transfers heat well but also comes with the biggest price tag. Aluminum alloy is also very lightweight, conducts heat evenly, but is prone to denting and scratching. The upside is it is very affordable. So you can see there are certain qualities with each material and you will need to decide which fits your needs best. 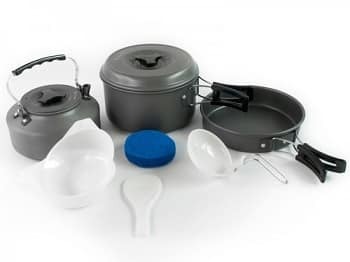 Cookware and mess kits come in a variety of shapes and sizes. It will be good to know what you intend to cook and then make sure the cookware you select will handle it. If you need to just heat water so you can reconstitute your meal you could probably get away with just a small pot with a good lid. If you hope to cook larger, more sophisticated meals you may need a variety of sizes in a cook set. Depth: how deep it is for boiling water; one cup vs. one quart. Base diameter: this is the distance across the bottom of the pan. For one person, a smaller diameter will be sufficient. For larger groups, you will need a larger pan, but make sure the material transfers heat well. If it does the diameter can be larger than the camp stove burner. If not, stick as close to the burner size as possible. Volume: This refers to how much the cookware can hold. A typical serving is about 2 cups. So, determine the number of people you are cooking for and multiply by 2. That will be your volume. So for 4 people you would need a pot or pan that will hold about 8 cups of food. 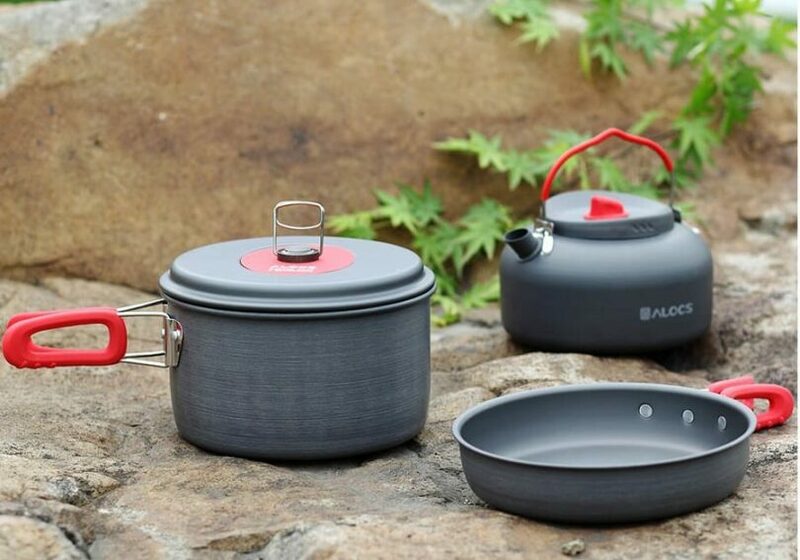 Description: The Winterial Camping Cookware and Pot Set 11 Pieces is made of aluminum oxide which has some great qualities. It is inexpensive, conducts heat well and is lightweight. This set also has a Teflon coating, so it will be easier to clean up after your meal is over. The Winterial is designed to withstand high temperatures. Even the rubber coated handles are heat resistant and will never melt according to the manufacturer. This set seems to have it all and it nests together very nicely. A great piece is the tea kettle, although minimalists would consider it pure luxury. The volume of this set is perfect for one, but large enough to feed two people. Its compact size would make it easy to clip to the outside of your pack with a carabiner. Description: The Pinnacle Cookset is constructed of anodized aluminum with a Teflon non-stick coating. The items in this set are color coded to provide personalized tableware. These color coded items are made of Infinity polypropylene. This set can easily handle meal preparation for 1-2 people. This set is nested and fits perfectly into the ruggedized case that works well as a sink. If you stack the items just right you can also fit other small items in the case such as tea or spices. The crushproof, heat-resistant strainer lid fits both the pot and the frying pan. 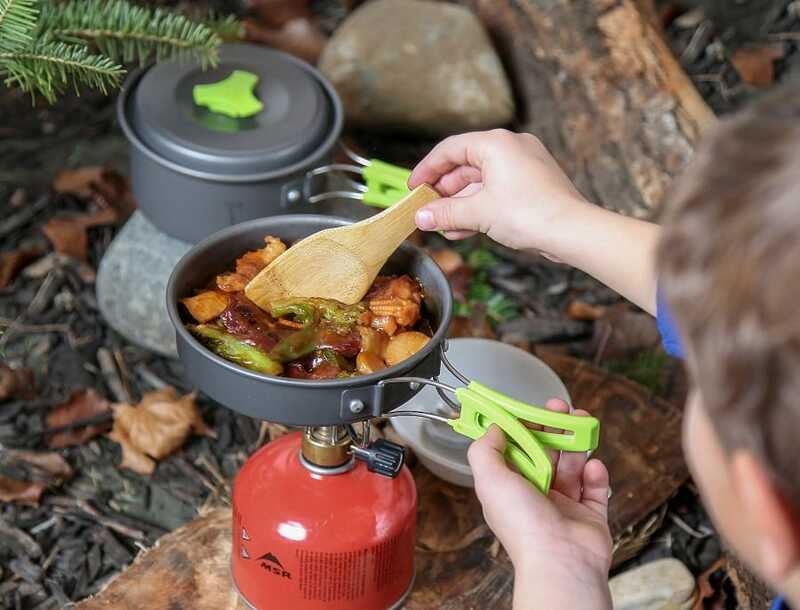 The set only comes with one pot gripper, so you may like to get an extra one so you don’t need to switch back and forth if you have both pot and frying pan in use. The gripper is about $12. 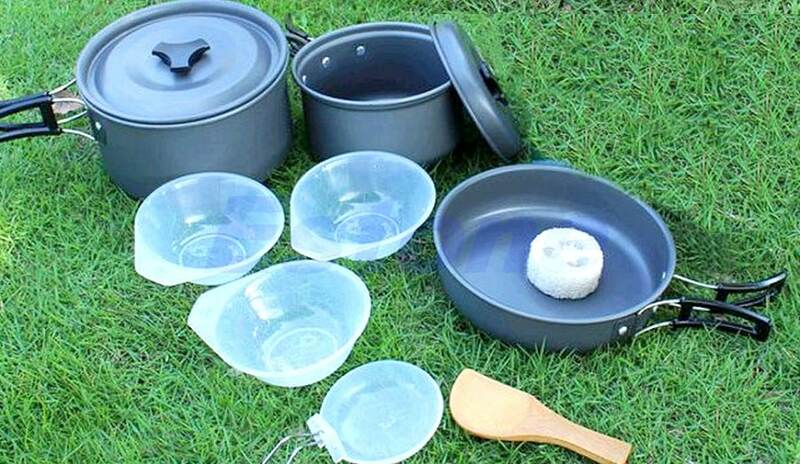 Description: This G4 Free Outdoor Camping Pan Hiking Cookware Backpacking is ideal if you don’t need a lot of fancy extras. 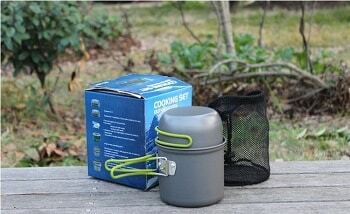 The set is nested but has plenty of space to fit a small camp stove, spices, teas, and other smaller items. Constructed of anodized aluminum with Teflon coating, the set is durable and reliable. It heats up evenly. The foldable wire handles are silicone coated to protect from burn hazard. The silicone will melt, so make sure it does not get too close to open flames. The volume is perfect for 2 people. However, the number of pots and pans may allow you to stretch it to 3-4 people depending on what you are cooking. The frying pans can double as plates or bowls and can be used as lids on the pots. The large pot holds 6 cups and the smaller pot holds 5 cups. Description: This MSR Alpine 2-Pot Set is made of stainless steel, which adds to the durability, but also adds to the weight and the cost. Stainless steel is not the best conductor of heat and it takes a long time to boil water and hot spots are created easily. The pots nest together nicely and the lid makes it one enclosed package. There is plenty of room to fit a small camp stove and possibly fuel depending on how long you will be gone. The volume is great for 1-2 people. One pot is 2 liters and the other is 1.5 liters. The lid can double as a plate. Because there is no non-stick coating these pots do not clean up the easiest. But, because it is stainless steel, you can use any kind of scrubby on it to get it clean and it will look as good as new. Description: This Sea to Summit X Set 31 is somewhat of a hybrid in that the bottoms are made of anodized aluminum while the body of the pieces is made of silicone. Another great feature is this set can fold flat. The silicone is what allows this set to squash down to just fractions of an inch in thickness. While all these features seem cool, there is a caveat – the flames cannot touch the sides at all as the silicone will melt. The set also cleans up easily, but it is recommended to wash right away as food odors can become attached to the silicone. The bowls also have the metal bottoms and can become too hot to handle when hot food is served in them. The silicone is also very soft and not easy to hold securely. Also using sharp items in the vessels could damage the silicone. The volume of this set is for 2 people. Description: The Snow Peak set is constructed of titanium which offers strength, durability, lightweight, and pricey. But it is probably perfect for a minimalist who is looking for the lightest load. The set is constructed with rounded edges which are great for easy clean up. The insides of the vessels are marked with volumes, i.e. 5-, 10- & 15- ounces, for ease of use. Another drawback of titanium besides price is that it is not a great conductor of heat. So you may struggle with hot spots while cooking. This can be overcome by constant watching, stirring, and movement of the pan. You will also some sort of pot lift because the handles are not insulated and will conduct heat. The volume of this set is perfect for two, but can be stretched to 4 people if necessary. The large frying pan will hold 4 eggs and the small frying pan can cook 2 eggs. 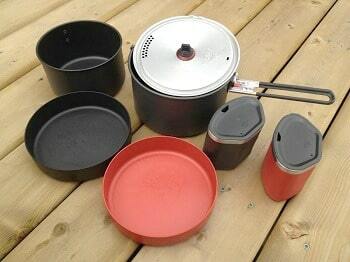 The nesting set will accommodate a small camp stove inside if small enough. Dimensions: 7.75 x 5 in. Description: Constructed of anodized aluminum with one non-stick pot and one regular pot, this set is versatile, compact and lightweight. The nice thing about aluminum is both the price and how it conducts heat. Both features offer great value. The pots of this MSR Quick 2 System also have measurement lines for ease of use. The large 2.5L pot can be both very useful for cooking larger meals or as a sink for clean up and a pain to fit in your pack. There is only one pot handle with this set so it is difficult to use both pots at once. It is recommended to buy a second handle. The handle flips over the lid to hold the whole nested set together for packing. The plates can double as bowls. The plates and mugs are made of plastic but are sturdy enough to handle boiling water. Since they are plastic they will cut and scar if a knife or sharp object is used on them. This set is great for 2 people. While there is no large frying pan included in this set, one can be purchased ($30) that will nest with the set. Description: This Stanley Adventure Two Pot Prep and Cook Set, Stainless Steel is constructed of stainless steel which is rust proof. The plastic bowls and lids are BPA free. One unique feature is a tri-fold cutting board that can also double as a serving tray. A common drawback of stainless steel is the weight. This set comes in at almost 3 lbs. which takes up a lot of precious cargo. If going in a familial group you could split the set and distribute the weight and pack things inside to gain back some volume in your pack. 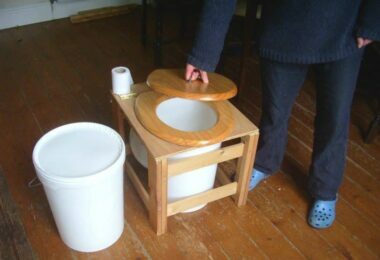 Or you could leave the smaller pot at home if you felt like you could get by with only one pot. Another unique feature: covers for all the vessels. That makes it great to keep bugs out of all your dishes, can seal things up tightly. This set is great for 2 people, but the pots can actually feed 4 people. There are only two bowls included which can be a drawback if you have a family of 4. Description: This Primus Litech Ceramic Non-Stick Surface Frying Pan with Silicone Handles is made of anodized aluminum with a ceramic non-stick coating. The integrated, folding handles have silicone coated handles. This temperature resistant pan keeps food from sticking and burning. The non-stick coating makes it very easy to clean. The handles fold back to the pan making it easy to pack in your backpack. One thing to watch is that the handles do not get too close to flames as the silicone will melt. This pan is perfect for the minimalist who can use one pan for everything. Description: The Optimus Terra set is constructed of anodized aluminum with a Teflon non-stick coating. There is also a non-coated pot to give you versatility in cooking. The HE in this set stands for Heat Exchanger, which reduces boil times by 20%, saving time and fuel. This set only comes with one pot lifter; you may want to get at least one more in case you are cooking with more than one pot at a time. The neoprene storage sack actually doubles as a cozy that can keep food warm. 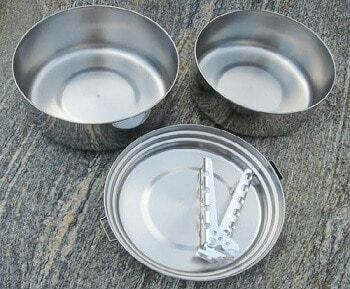 Another great feature is this set will hold any Optimus stove; again, saving volume inside your pack. Both pots have measurement indicators which add to the ease of cooking. The frying pan also doubles as a lid for the pots. This set is perfect for two people to have a nice meal and something warm to drink. Easy cleanup and compact storage add value to this set. See our earlier article on the best camping stoves to help you with more options. 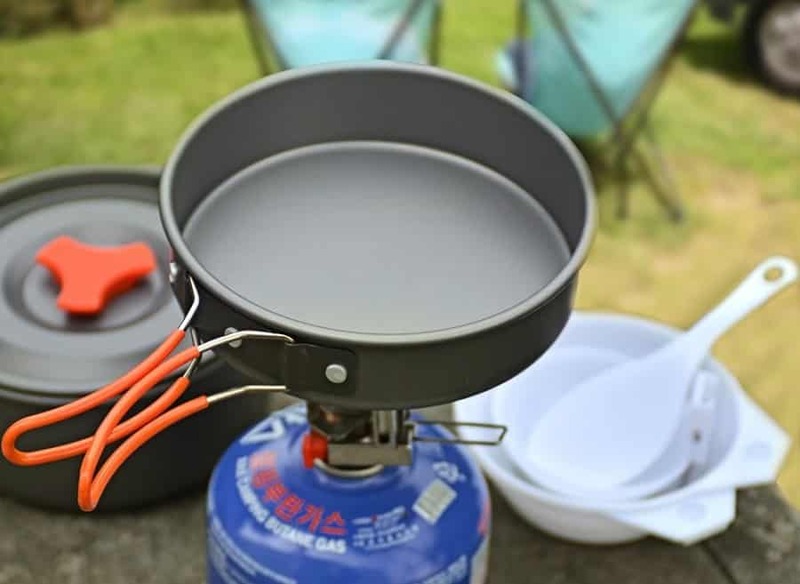 So there you have the top 10 best camping cookware sets. There is literally something here for everyone from the novice to the expert, from the minimalist to the car camper – you should be able to find a set that meets your needs. Things to keep in mind: materials can be expensive or affordable and heavy or lightweight; most sets are multi-functional; great for 1-4 people. While you can cook for up to 4 with some of these sets, there were typically only dishes and cups to accommodate 2 people. Don’t forget to consider your heat source. Most of these units were not suitable for the open campfire. Those with silicone need special attention when cooking and close to the heat. Camp stoves are not included with any of these units, but most could accommodate a small cook stove inside the kit. Here’s to happy camping and happy cooking! Check out our article on the best campfire cooking equipment to have a memorable experience outdoors.